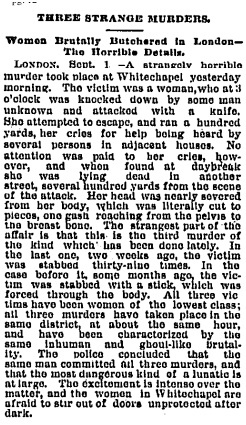 The Tribune, like most papers, followed the Jack the Ripper case closely, printing every rumor (including the stories about a an American suspect named Mr. Tumblety who is now thought to be among the strongest suspects). By this time, of course, H.H. Holmes had been in Chicago for at least three years, and had probably already killed more people than The Ripper ever would. 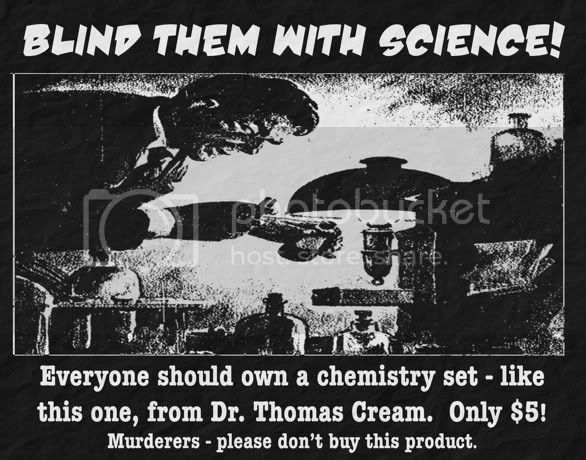 And, at the same time, a man named Dr. Thomas Neil Cream was in Joliet Prison – he had murdered several people in his office, near where Madison and Racine meet today (or within a block or two of there, anyway). He would eventually be released and drift over to London, where he’d kill again, and utter the words “I am Jack The…” just before the trap sprung on the gallows. There are those who say that Creame was actually NOT in prison in Joliet in 1888, but had been replaced by a double, and was, in fact, in London, committing some of history’s most famous murders. More on him is in the Weird Chicago book!